The main culprit behind the end of the dinosaurs is now widely accepted to be an extraterrestrial collision of epic proportions, one that left behind the gargantuan crater of Chicxulub at Mexico. Evidence for this theory grows more ironclad over time – yet only 30 years ago it was often thought to be nonsense. It took a long battle to win many scientists over, researchers say. One of those researchers is University of California at Berkeley geologist Walter Alvarez, who recalls the resistance to his team's claim that such a major change could happen abruptly instead of gradually. This reasoned skepticism "is exactly what should happen in science," Alvarez told SPACE.com. "Radical new ideas must be challenged and tested, and that really happened extensively with this idea." Dinosaurs ruled the planet for a staggering 135 million years. Their age came to a dramatic end about 65 million years ago in the most recent and most familiar mass extinction — the end-Cretaceous or Cretaceous-Tertiary extinction event, often known as the K-T boundary. 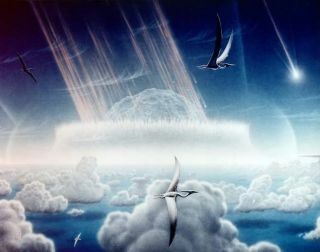 But the Chicxulub asteroid impact scenario was not immediately accepted when it was proposed. The notion that a cosmic impact from an asteroid or comet triggered this mass extinction began with the discovery of a layer of clay enriched with iridium. This metal is rare on Earth's surface but relatively common in space rocks. Given this "iridium anomaly," the father-son duo of Luis and Walter Alvarez, along with Frank Asaro and Helen Michel, proposed in 1980 that an extraterrestrial collision finished the age of dinosaurs. The elder Alvarez was a Nobel Prize-winning physicist; Asaro and Michel are nuclear chemists. Geochronologist Paul Renne, director of the Berkeley Geochronology Center in California, recalled that he was "very skeptical. I was an undergraduate at Berkeley at the time, where you had the Alvarez father-and-son team, so there was probably a major incentive to accept this idea as really cool, but I thought it was really far out and nonsense, to be honest." Throughout the '80s and '90s, different lines of investigation accumulated evidence that an extraterrestrial impact really did kill off dinosaurs. "I was skeptical at first, but I soon started finding fairly dramatic evidence of plant extinction at the boundary," paleontologist Kirk Johnson at the Denver Museum of Nature and Science told SPACE.com. Geochronologist Paul Renne collects a volcanic ash sample from a coal bed within a few centimeters of the dinosaur extinction horizon. A study by Renne and colleagues confirmed the link between the Chicxulub asteroid impact and dinosaur extinction 65 million years ago. Image released Feb. 7, 2013. Geophysicist Sean Gulick at the University of Texas at Austin noted "the size of the iridium anomaly was such that it was hard to argue that it was anything else but an extraterrestrial impact. But the concept seemed so fantastical that it took a long time for the scientific community to come around." Then, in 1991, researchers found evidence that the giant crater near the town of Chicxulub (pronounced CHEEK-she-loob) in Mexico came into being about the time of the mass extinction. The explosion that created the crater, which is more than 110 miles (180 kilometers) wide, likely involved a hit from an object about 6 miles (10 km) across. The crash would have released as much energy as 100 trillion tons of TNT, or beyond a billion times the power of the atom bombs that destroyed Hiroshima and Nagasaki. "When that crater was found, for most geologists that wrapped up the question of whether an impact was involved in the mass extinction," Alvarez said. Still, not everyone believes the Chicxulub impact was behind the mass extinction. For instance, geologist Gerta Keller at Princeton University maintains the explosion took place 300,000 years before the end-Cretaceous extinction. Some researchers have explored other possible culprits for the disaster, including other impact sites, such as the controversial Shiva crater in India, or even massive volcanic eruptions, such as those creating the Deccan Flats in India. However, Renne and his colleagues have now discovered the Chicxulubimpact and the end-Cretaceous mass extinction event happened no more than 33,000 years apart. These new findings, appearing in the Feb. 8 issue of the journal Science, support the idea that the extraterrestrial collision dealt the age of dinosaurs its death blow. "I've been involved in a lot of research that's explored huge correlations between mass extinctions and massive volcanism, not impacts, so I've really come at the idea of a cosmic impact from the outside," Renne said. "A few people have said the crater was the wrong age, but I think these new findings very strongly settle that question," Alvarez said. "There were huge volcanic eruptions at the Deccan Flats to have taken place over a period of something like a half-million years about when the mass extinction did, so volcanism may have something to do with it as well," Alvarez said. In any case, "we now have a completely different view of how the Earth works in terms of gradual changes versus catastrophic changes," Alvarez said. "I think in 1980, the general view was that all changes in Earth's past were gradual, and that if you were thinking about catastrophic ones, you were not being catastrophic. I still think that most changes in Earth's history were gradual, but when good strong evidence comes for a catastrophic event, we'll now accept it." Future research can drill right into the heart of the crater "to study the process of what happens when you have an extremely large impact on Earth," Gulick said. "Maybe we can learn more about how this particular impact helped result in the extinction of 75 percent of all species on Earth."